The verdant city of Tawa home to Tawa AFC and the Tawa College 1st 11 is a footballing community boasting some of the best footballers in the country and a large population of good cunts. Tawa has been called the "City That Never Sleeps" by some and the "New Zealand Bible Belt" by others; there have been countless other names also (some nice and pink and fluffy, and some really more hurtful than necessary). Many refer to it as 'The Capital City of The Capital City', and you can take that to the bank (BNZ at the back of the mall, because Postbank shut down and the ANZ closed too). This delightfully diverse suburban sprawl takes its name from its founding mother 'Lynn of Tawa', who according to legend washed up on the shore of the Willowbank stream in a shoebox the size of a homicidal rabbit and proceeded to create the bustling location Tawa is today. 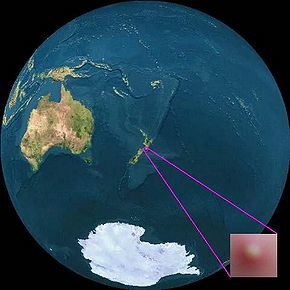 Tawa Flat was first settled by a small pink tribe of hyperactive children from the Faraway Hills who established a thriving civilization that only began to flourish during the middle of the 20th century. The remaining ruins of this period can be found in the very center of Tawa and are now known as 'The Mall' and 'Tawa Junction'. Locals talk of legends such as Pete the Ice-Cream Man (mothers, watch your daughters), and Aaron the Trolley Boy at Woolworths whose charismatic personalities and crazy antics made Tawa such a happening place in the Golden Age of the 1980s. In the early 1960s, State Highway 1 was built through Tawa on the Eastern side of the valley. The line of the motorway effectively followed the glorious Railway Line already established through Tawa so the Mayor of Wellington Kerry Prendergast could drive home to Tawa and save 1 1/2 minutes commute. Since the mid-20th century Tawa has been slowly but surely expanding, mainly spreading Eastward up onto the hills of the Belmont Range. This has caused much concern and panic among locals as said Range separates Tawa Valley from the infamously depraved Hutt Valley, and any further spreadage would enable shameless cross-breeding between the two distinct Northern Suburb Gene Pools resulting in a mutated freak of nature so horribly retarded that it would summon the next great Wellington Earthquake and wipe out both areas in a cataclysmic armeggadon with lots of fake blood and screaming and massive billion-dollar special effects. Tawa boasts a huge array of activities and attractions. The stunning Willowbank National Park is wonderful in summer but simply sublime in the winter. Water flows in the stream (when not walled back by the Hoover Dam, which is regularly constructed each summer by hordes of industrious school children) and collects on the grass to create a Wet-Winter-Wonderland perfect for picnics and those essential family gatherings, or even for the sedate, totally non-alcoholic Tawa College Formal after-parties. There is the Tawa Intermediate zoo which features strange unidentified extra-terrestrial animals in 18 exhibits called 'classrooms'. As as extra bonus, you may be lucky enough to spot a few species from Cannons Creek and Titahi Bay. Beware of these; if provoked they say things like "Oi! Do you want a hiding you homo?" Communication is easy, if not simple, with the local population. Vocabulary is pleasantly limited and the emotion expressed in everyday conversation with a resident gives you a sense of pride in your own home town. The gourmet establishment 'The Pink Pineapple' headlines an all-star cast of fine dining and culinary delights ranging from the traditional kiwi fish and chips to Chinese, Indian, and an old favourite but new feature in the city: "The pub meal". Tawa has been hailed as the cultural centre of the Pacific for a very good reason. It boasts a breathtaking library bursting to the seams with helpful staff and thousands of wallfulls of books rivalling the Bodleian and the Library of Alexandria, and also lays claim to the very convenient and much-admired set of public toilets just outside. It is the proud possessor of one single magnificent sculpture, which is located within the Mall and affectionately referred to as 'The Ovaries'. It is also the habitat of the beauteous structure known as 'The Lion's Erection' found just outside the culinary delights of Tawa Fish Supply. With such public art, is it any wonder that the locals are highly skilled in the arts of... art? Since the demise of the village elders in Tawa, the community has looked to other sources for wise counsel and prophetic opinion. Enclosed within the walls of the aforementioned Main Road fish and chip shop, lies the mystic wheel of fortune. This ancient contraption is the medium through which spirits and ancestors channel their energy and predict the future for Tawanians young and old waiting for their greasies. Originally, an offering of 2 cents was made to the gods but due to inflation 10 cents is now what the powers demand. Culture shock is a phenomenon experienced by some visitors to Tawa and there are some methods we recommend to help combat this. Adopt an open-minded attitude; this isn't your average city. There will be times you will be both shocked and amazed; try to take it in your stride and live in the moment. When asked a question it is polite to offer an answer (a few syllables or a simple grunt or nod will usually suffice) and pay them the respect of eye contact before returning your gaze downward. The local co-ed college is run by the music department aka "The Murrays". It has the school biggest choir in New Zealand, probably because if you wish to take music you have to be in the Dawn Chorus. Every Friday morning sleepy students turn up to the hall before 8am to preform this ritual. The punishment for missing choir practice, and other such offenses, is "Murray-Bashing", which involves being highly embarrassed by all 3 music teachers, who coincidentally all have "Murray" in their names, in front of a large group of your peers. Murray-Bashings are dealt out to any student fortunate enough to not be a "Murray-Pet" on a regular basis. "Murray-Pets" are those particularly "gifted" students who can sing, and don't hide it, like the rest of the students who are smart enough to realise that being "discovered" by The Murrays is in fact NOT a good thing. Social activities include rugby, christian youth groups, and church (there isn't much else). Another of Tawa College's main attractions is their, by far most succesful extra-curricular group, the death metal band, Anosmia. Many have tried to infiltrate their musical minds, but few have succeded. They enjoy singing about "Dying" and "The devil". Their front man reece davies enjoys writing "Heavy as hell" guitar riffs into his computer in the music room and grunting under his breath to practice for the band. They are currently working on a music video with the I.T department, wich just so happens to be made up of nothing but "Murray-pets". The "Wednesday thing" is both the christian lunch time group and the gay support group, though the christian group seems to be unaware of the other group. The infamous black pant day was a protest in 2005 where the entire population of girls turned up in pants in an effort to get the uniform for the girls changed. This was a non event as most girls forgot to wear pants on the selected day. After significant amounts of pressure the uniform was changed to include black pants, however this was later changed due to lack of interest, much to the pleasure of the boys, who enjoyed following the girls on windy days. The Tawa Association Football Club is well known for being the best football club in Wellington and arguably the best club in New Zealand. The Tawa AFC 1st team are coached by the infamous Richie Martin and boast a squad with some of the most talented players in the footballing world, such as Karl Romijn and Steve Romjin. The team plays at there local home ground Redwood Park which holds a capacity of 100,000. The Tawa College 1st 11 are the top college side in Wellington and in New Zealand, in 08 coached by Martin Romjin the side is bringing back the glory days to the college, the players are hero's inside the community and the college. The team is renown for getting in HARD and playing a arsenal style of football. On game day the squad can be heard singing 'Im forever blowing bubbles" and 'Martin Romijn's yellows army' from the changing room, home games draw a number of 7,000 to 8,000 to the tawa college bottom field. On the 14th of may the college received a $2m offer for the techniquely gifted winger Robbie McLachlan from FC Porto and a $5m bid from Fulham FC. But the future looks bright for the young winger who draws comparisons to Cristiano Ronaldo and Ricardo Quaresma. "he is such a talented player and great guy i wouldn't be surprised if he is playing in the premiership soon, it would be great to play with him again" Child hood friend Papa Bouba Diop currently at Portsmouth FC. Also notable is the tawa college 4th 11. This elite and supremely selective team was founded in 2009 by the superb footballers Matt Allan and Krishan Prasad, and Hayden Murray, an aspiring youngster quickly making his way up through the ranks. In 2009, their opening season, they are well on track for a home semifinal. While the 4th 11 regularly has a squad greater than 17 for their home games played at the colleges top field, they struggle to match these numbers on there away games in which co-captain Krishan has to compensate with his intensely emotion and stirring half time speeches. These weekly speeches bring the team to tears and have been nominated for several awards, the Nobel Peace prize included. Nick Johnston, known to many only as "Captain" is the born leader for the 4th 11 and the team often look to him for guidance and direction. Tawa College's football ability is in direct contrast to the schools performance in rugby. In 2003, their rugby team defaulted twice in two games before pulling out of the competition grade (much to the disappointment of the Onslow College rugby side, as both games were defaulted to them, and these were the only two games that Onslow's rugby team won that year). No one is known that can/will provide information as to why the Tawa rugby team was pulled out, though two of the rugby players from the rugby team were reported missing. Tawa is well known throughout the kingdom of New Zealand as a wellspring of culture. It is also well know as the place with the most churches per-capita in the nation. This coupled with the fact that up to very recently it was the last place in New Zealand with a liquor ban should give the reader some indication as to the atmosphere of the place. 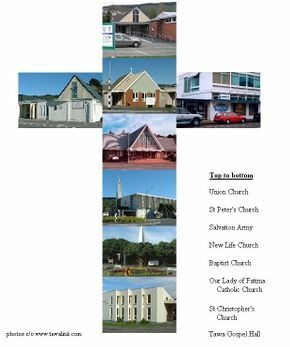 In any case the phenomenal number of Christian churches of different denominations can be viewed safely from the car window whilst driving along the Main Road, making choosing a denomination that much easier. Indeed, Tawa subscribes to the Stephen Colbert philosophy; be you Hindu, Jewish or Muslim, Tawa provides infinite paths to accepting Jesus Christ as your personal saviour. The two big players in the Tawa-Christian Game are the mighty Roman Catholics and the proud Anglicans whose churches stand face-to-face across Lyndhurst Road. Although no serious violence has broken out between the two groups in some months the locals are aware that the situation could erupt on any given Sunday. Further north the ambitious Tawa Baptists can be found, who in the 1990s attempted a coup d'etat of Tawa by infiltrating the local College and trying to force the innocent future generations into submission. Observers say that although the Baptists have since called a temporary ceasefire, this militant form of Christianity has begun to work its way into the local education network again, this time through assiduous plotting from students involved in the movement. Grease is the word, is the word that you heard... for some, but for Tawa 'Stunning Diversity' is the word. Or words, if you're grammatically insistent. The stunningly multicultural Tawa houses a wide range of families: from white, middle-aged bureaucrats with bogan sons, to white, middle-aged bureaucrats with slapper daughters. North of the hedonistic liberals and drunken, unruly students residing in Wellington City and south of the ascetic, spartan natives in Porirua, Tawa is the perfect place to live an insulated life in a self-sustaining cheese-farming economy. However, adrenaline junkies (or just normal junkies) looking for a thrilling rush and a chance to move sideways up the ladder often opt for a dangerous career change with a shift to the local supermarket, Woolworths (affectionately known as 'Woollies' by the locals as it reminds them of every New Zealander's favourite pastime). As a very high-risk job, such tasks are not for the faint hearted. They include having to interact with customers at the till, having to ask "Do you have a Onecard?" (also at the till) and being able to stack towers of toilet paper on the shelves, a heart-stopping performance only achieved by the most talented and skilled of workers. To keep the mighty till workers at Woolworths coming back to work each week, Phill, the infamous Checkout Manager, has ingeniously conducted a scheme to trick the workers. This is the productivity report. Each week, every operator must go through an enduring obstacle course including hurdles, mass-number memorizing, and operating an offline eftpos machine. These things, combined with their total speed they show while working at the checkouts determines a score ranging from 0 to 5000. To this date, only Flam Malf has been able to get past the score of 150, achieving an incredible 327.8. Murray Mexted: "You don't want to see hookers going down on players like that"
"I don't like this new law, because your first instinct when you see a man on the ground is to go down on him"
This page was last edited on 10 September 2012, at 04:15.